A team of scientists at the U.S. Department of Energy's Ames Laboratory will be developing new instrumentation aimed at determining the chemical and structural makeup of plant cell walls to better understand how to convert plant material into bio-energy. 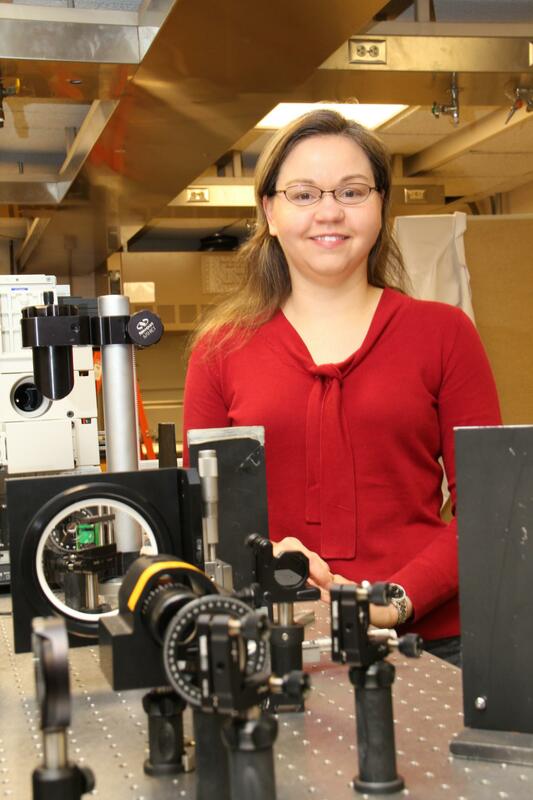 The group, led by principal investigator and Ames Laboratory scientist Emily Smith, is receiving $1 million a year for three years from the DOE's Office of Science to develop a subdiffraction Raman imaging platform that will provide an unprecedented look at the specific chemical structures of plant cell walls and then determine how best to deconstruct plant material as a source of biofuels. "The problem we have is that we can only get spatial resolution of a couple hundred nanometers due to the diffraction of light," said Smith, who is also an Iowa State University associate professor of chemistry. "When we look at plant cell walls at that resolution, we lose information about specific chemical details. At best, we get an average of the composition." "However, if we can get to the subdiffraction level as we propose to do, it will open up new avenues to understanding the details of the cell walls," Smith continued. "The trick is to apply laser pulses in the right way so that you gain the resolution you need without destroying the sample in the process." The instrument will be unlike anything currently available used to study biomass. To build such a complex instrument, Smith is working with pulsed laser spectroscopy expert Jacob Petrich, as well as computational and theoretical expert Xueyu Song, both Ames Laboratory scientists and ISU chemistry professors. "We'll rely on Xueyu's modeling and theoretical predictions to guide us in assembling the instrument," Smith said, "to eliminate as much guesswork as possible." The instrument has its origins in the class of super-resolution imaging methods referred to as stimulated emission depletion (STED). It will initially be built in Gilman Hall and will be moving to new space at Ames Laboratory's Sensitive Instrument Facility in late spring. That space will be customized for the instrument and will be located near Ames Laboratory's battery of high-powered electron microscopes. "We'll be collaborating with (Ames Laboratory scientist) Tanya Prozorov who has been doing in situ correlative optical and electron microscopy on biological samples in their natural, fully hydrated state," Smith said. "By comparing our chemical analysis results with the high-resolution images Tanya can provide, we hope to better interpret what we're seeing in these natural polymer structures." The team also will obtain input on plant cell walls and biomass from Olga Zabotina, Ames Laboratory scientist and ISU associate professor of Biochemistry, Biophysics and Molecular Biology, looking primarily at Arabidopsis and Brachypodium transgenic plants with modified cell walls, which were generated in the Zabotina lab as a toolset to understand cell wall impacts on plant fitness and biomass quality. The group will also eventually investigate what happens as microbial action breaks down the plant cell walls. Ames Laboratory scientist and ISU assistant professor of Chemical and Biological engineering Zengyi Shao will provide a variety of microbes and enzymes, to identify and possibly tailor the ones that provide the best pathways to break down the cell wall structures into the most advantageous materials for biomass conversion. "We plan to develop instrumentation that provides the resolution needed to understand plant cell wall structure so we can better tap it as a source of sustainable biofuel production," Smith said. "While it initially will be used for that specific purpose, the technology could have applications for a range of biological samples."